With its ancient temples and shrines, willow-lined streets, inspiring old-world charm and the world’s finest onsens, Kinosaki Onsen is a delight to visit at any time of the year but if you would like to enjoy the onsen town’s most impressive drawcards with an extra splash of colours, this autumn might be the perfect time to do just that. According to Visit Kinosaki, autumn is not only the perfect time to witness Kinosaki’s physical features in their most colourful form but also presents a perfect opportunity for discerning travellers to explore some of the more unexpected seasonal treasures. 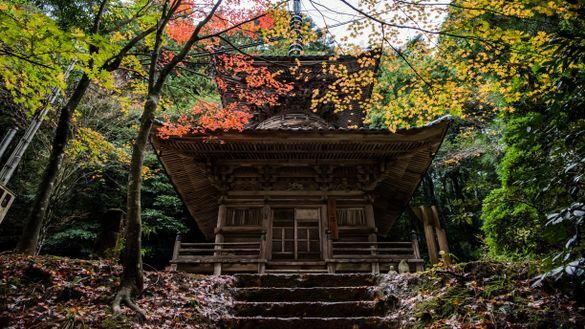 Visit Temples and Shrines: Kinosaki’s temples and shrines come to life in an extra magic light thanks to the red and gold autumn foliage autumn brings. Onsenji Temple located halfway up Mt. Daishi is reachable by cable car and allows travellers to admire scenery and history at the same time. The observation deck at t the summit offers great views of Kinosaki and surroundings. 45 minutes from Kinosaki Onsen, the Ankokuji Temple is most well-known for its azalea red leaves. Sample Autumn Food: Try some of the most iconic specialities in one of Kinosaki’s local restaurants or in your ryokan. Autumn specialties include Blackthroat Seaperch Fish and Kasumi Crab. Go Onsen-Hopping: Undoubtedly the most indulgent thing you can do for yourself on a cool autumn night is visiting Kinosaki’s world-class bathhouses. In Japan’s Best Hot Spring town, visitors staying at a ryokan get a free pass to visit seven public baths. From outdoor cave baths to ice saunas, travellers can enjoy the ultimate wellness heaven. Admire the “Sea of Clouds”: The views on the mountains don’t stop at the tree lines. In the early mornings from November to early December, the picturesque sea of clouds can be seen at Mt. Kuruhi nearby Kinosaki if conditions allow. This is a natural phenomenon in which fog and strata clouds cover an area due to radiative cooling in mountainous areas. Explore an old Castle Town: For the ultimate autumn fairy tale, head to “Izushi Castle Town”, about 40 minutes from Kinosaki, a castle town popular for its nostalgic atmosphere of old Japan. Wander around castle ruins, shrines, and temples and admire some of the local products such as “Izushi Sara Soba” and “Izushi Yaki” (pottery).